Thanks for giving me a little grace when I haven’t been able to live up to my commitment to post every day. I keep thinking, It was so much easier in October. That’s because there are fewer germs in October! Someone has been sick in my family for the last 6 weeks. It’s been a rough winter so far. But it’s also been a beautiful winter. 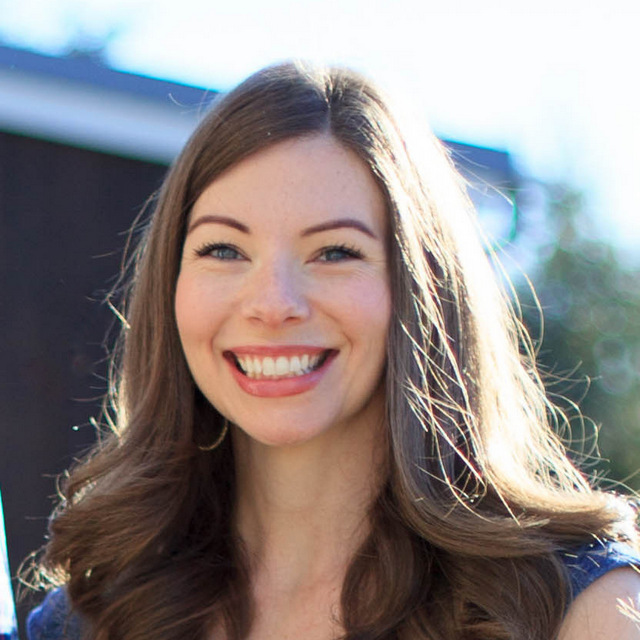 We had a quiet Christmas this year, and as we put the decorations away, I wanted to identify what I loved best and be purposeful in finding ways to make it last a little bit all year long. As I reflected, a couple of things stood out – the music (not traditional Christmas carols, but some beautiful, instrumental albums I found on Rhapsody that are festive yet calming), the soft twinkle lights on the mantle, the simple wreath on the front door. These are things that can continue throughout the year. Not necessarily listening to “Chestnuts roasting on an open fire” in July, but I can find some similar music that just feels like the season. And I’ve been working on some updates to the mantle – I’ll have a few more of them to show you this month. And a wreath. I was sad to take down our simple evergreen wreath with red ribbon. 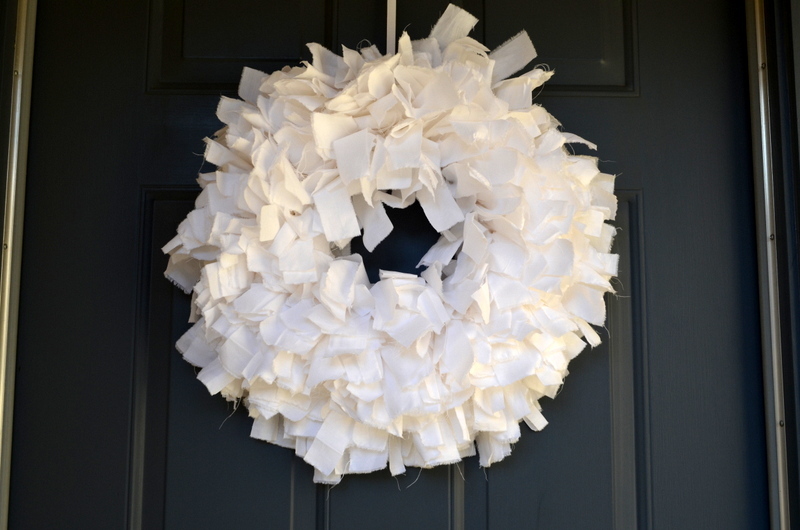 I’m not going to be crazy and keep my decorations up for weeks into the New Year – they didn’t even make it past New Year’s Day this year – but I can create a seasonal wreath that’s simple and makes me smile when I come home. I wanted something white. 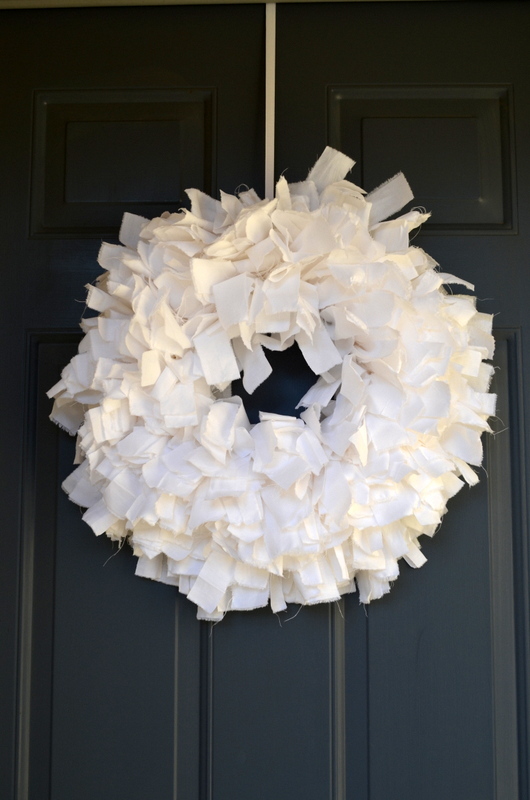 We don’t get snow here – I think we’ve had sleet once in the 10 years we’ve been here – but a white wreath might make me think of snow. 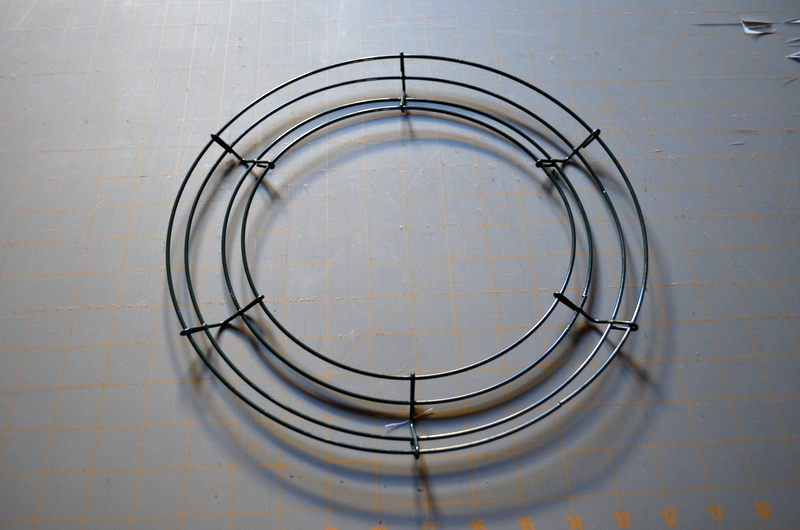 I started with a simple 12″ wreath base (got mine on Amazon). 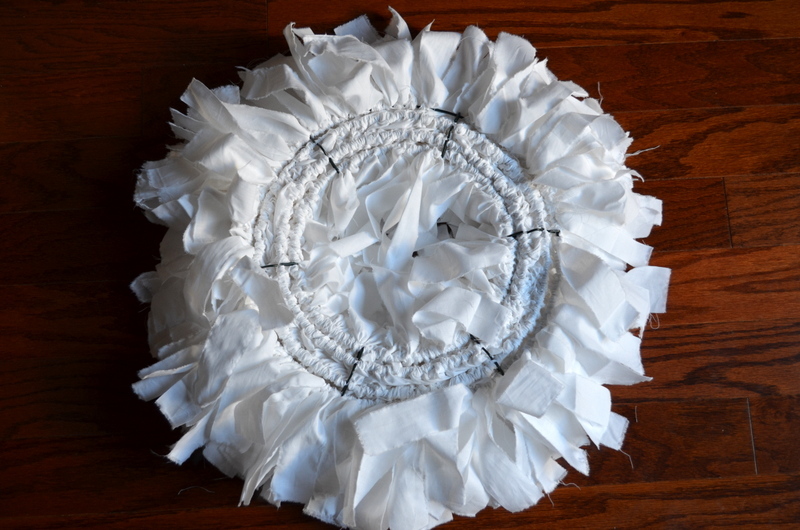 I knew I wanted the body of the wreath to be white fabric, so I dug through my fabric stash. 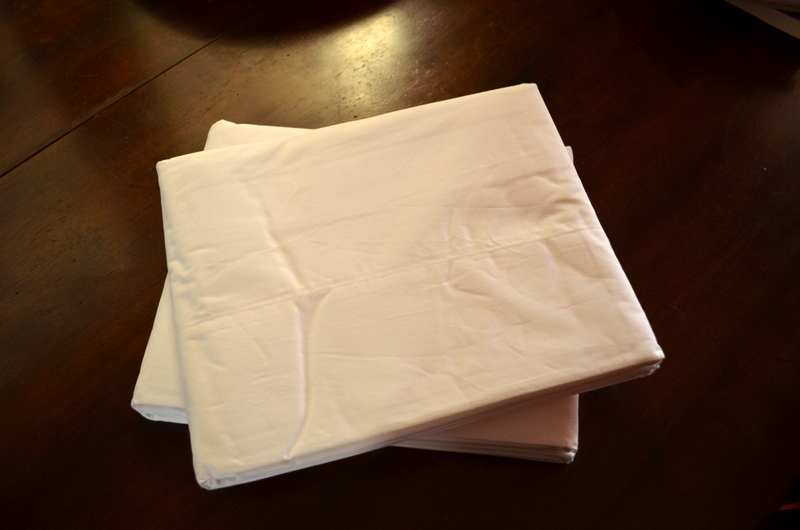 I found these old (but still in their packaging) sheets that I had bought to make a duvet cover. The double bed that these were to fit was packed away in the garage when the Boy made his arrival – almost 4 years ago. I’m not going to be using these any time soon. 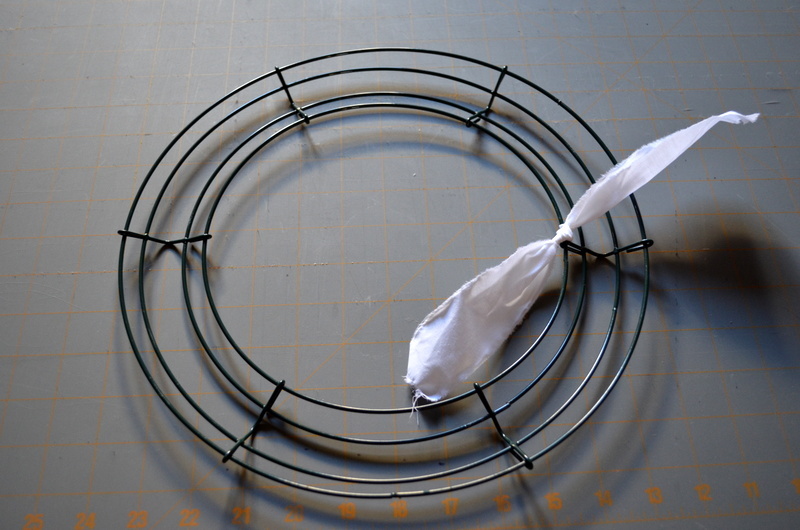 I only needed one double-size flat sheet for the entire wreath. As I’ve said a hundred times, I’m no professional seamstress, but I did learn from a good friend in college about warp and weft. She told me that, when you sew, you’re supposed to rip the fabric. The rip will follow the warp or the weft (I don’t know which) to make a straight, even line. 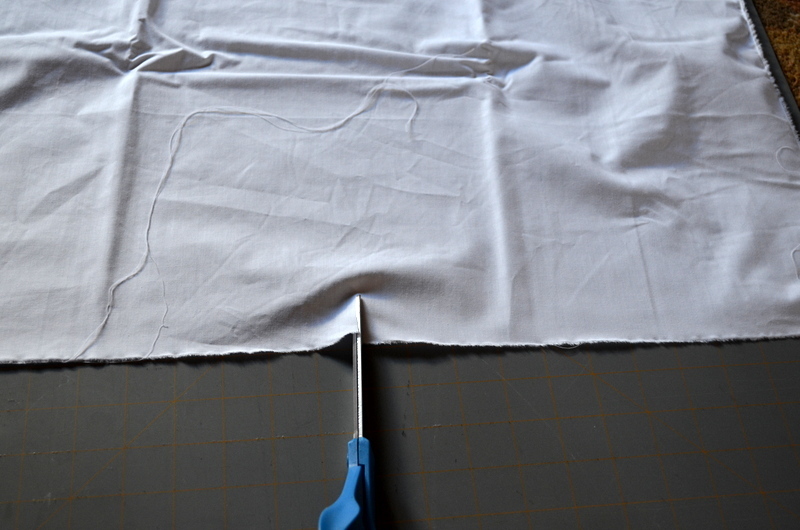 I have never actually done this when sewing something, but it is quite handy when you want to cut fabric quickly. 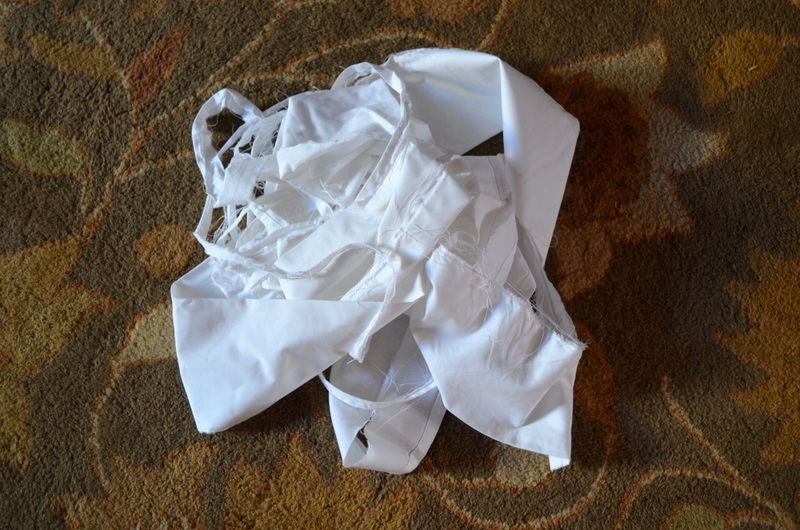 And I was really lucky with these sheets – I could easily rip the fabric in both directions, which isn’t usually the case. 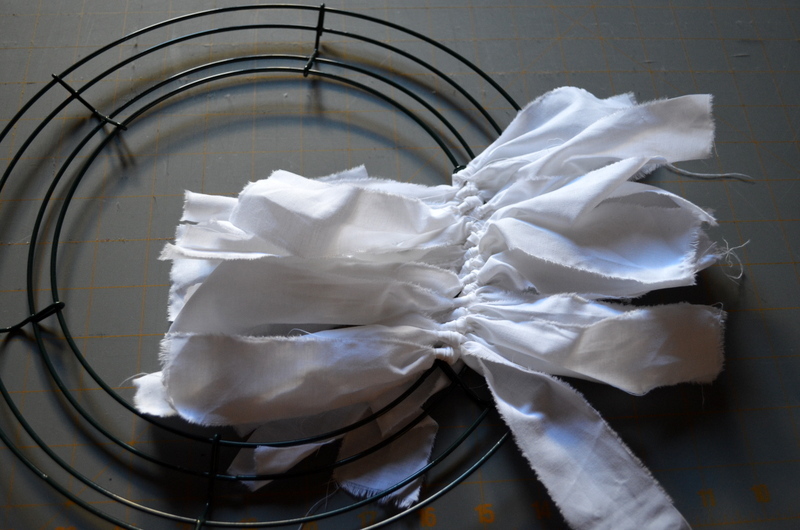 I started by making a snip close to the hems of one sheet. 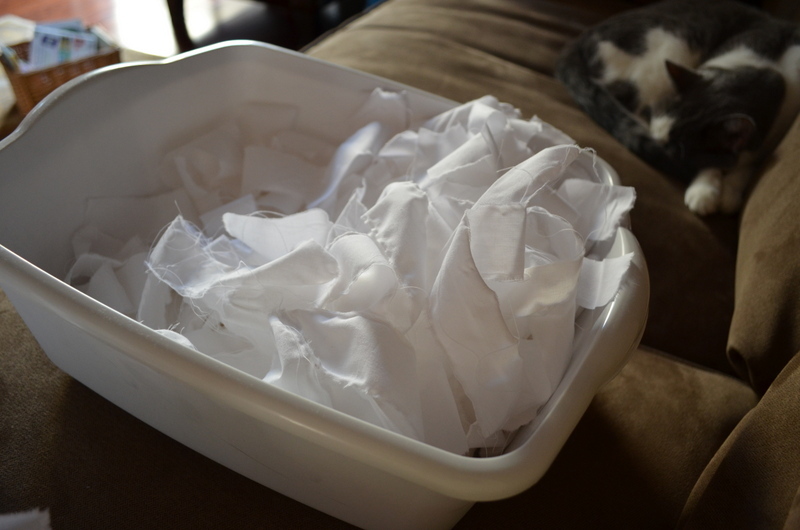 I ripped down the seams until they were removed and disposed of them. I wanted to make my fabric strips 1 1/2″ X 12″, so I measured out 12″ strips, snipping just the ends and ripping down the length of the fabric. Next I cut the 12″ wide strips into 1 1/2″ pieces. 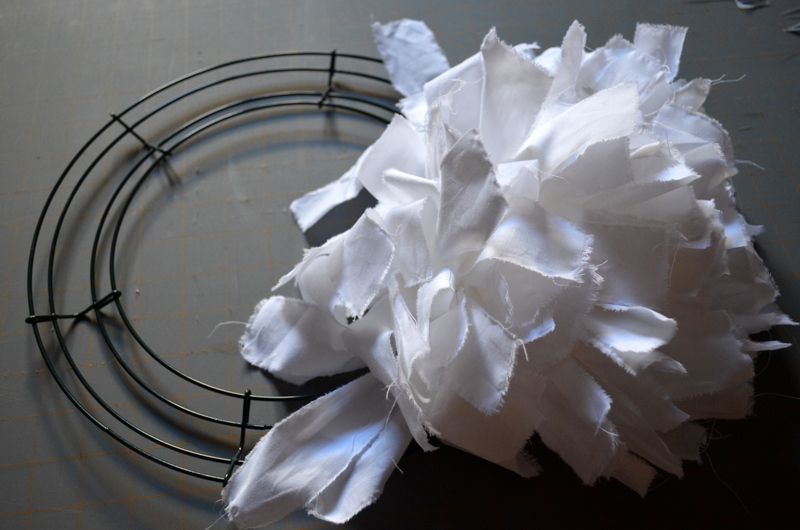 I placed the strips on my cutting mat, snipped at 1 1/2″ intervals, and then ripped the strips apart. 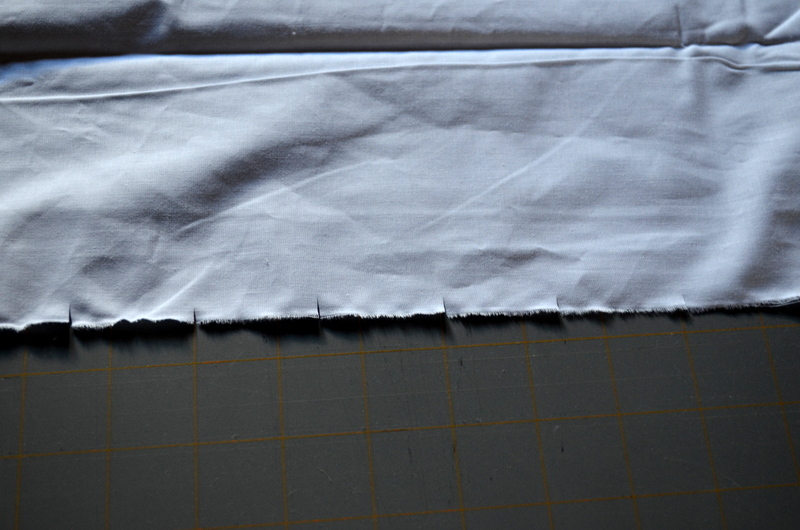 Note that when you rip fabric like this, there will be A LOT of thread that will come loose. That’s okay, just be mindful of it if you have a cat. Or children. It will make quite a mess. I found it easiest to work from the inside out, one section at a time. 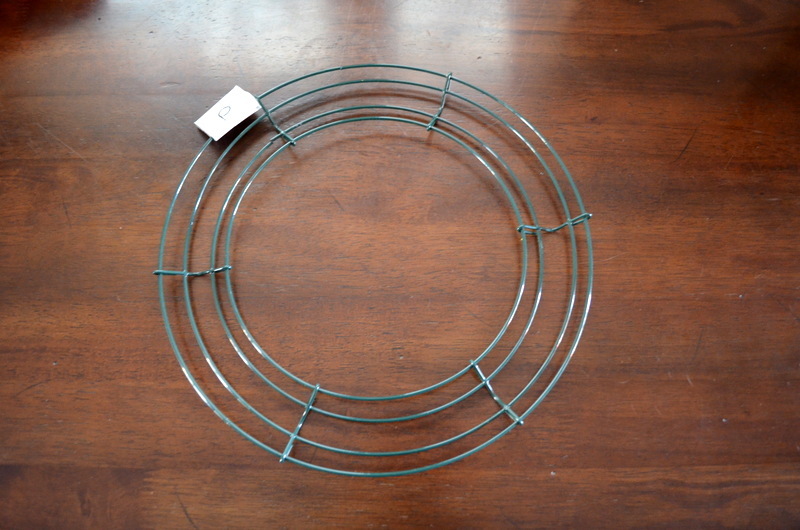 No fancy technique here, just tie each strip on the wires of the wreath frame. 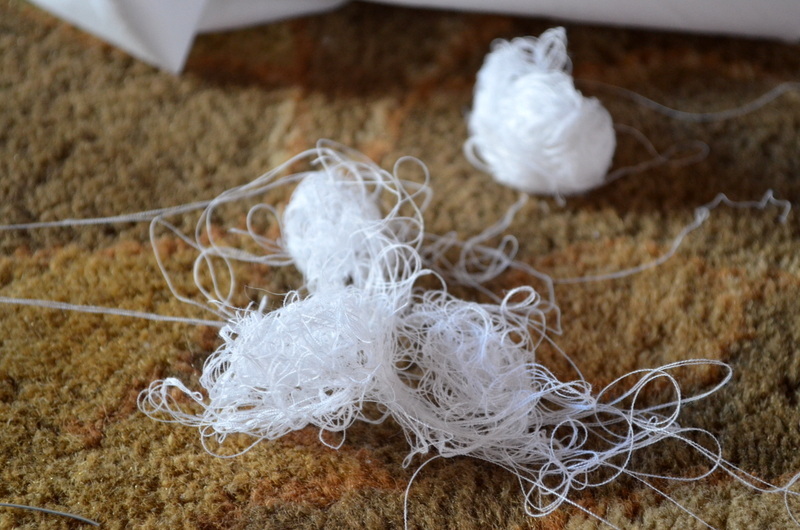 I just used a single knot – the strips will be so tight, they won’t come loose easily. I finished the first row of the first section sitting on the floor. I quickly realized I could be much more comfortable – and entertained – watching a show while sitting on the sofa. Molly decided to keep me company. She loves period dramas. I’m not gonna lie. 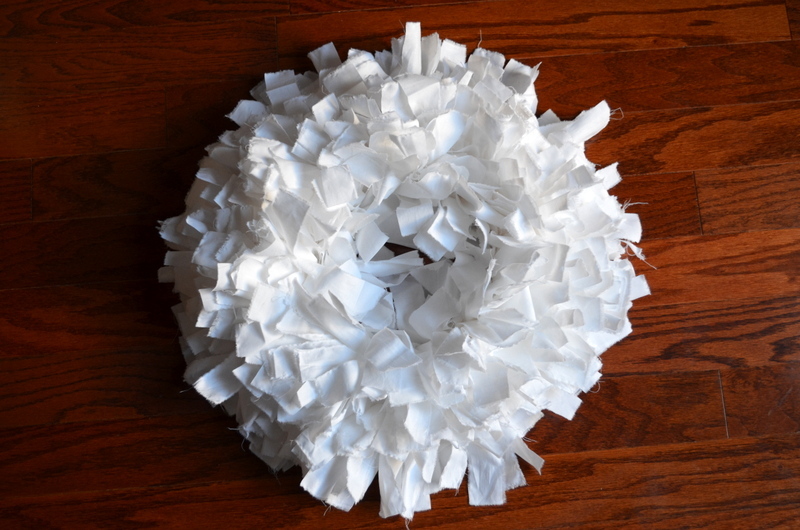 This wreath took quite a long time to finish. All told, I watched 1/2 of a Modern Family, 1/2 of an Antiques Roadshow, and 2 1/2 Downton Abbeys. Granted, these were without commercials, but still – not a quick project, but an easy one. I love how clean and bright it looks on our door. I know there will be loose threads from the raw edges, but I’m okay with it. If it starts to bug me later on, I’ll just give it a little trim. Not bad for a $6 wreath frame and a sheet. Really do love the wreath! Didn’t it snow (sleet or something) when I was out there that year? When we ate lunch at Olive Garden? I think so!!!! Yes! I think that’s the only time.